Neill Blompkamp's follow up to District 9 was something of a let down. While the visuals were stunning, the story and the characters felt a bit flat. The film's message about the conflict between the upper and lower classes as well as immigration issues was very, quite extremely, in-your-face. In addition, Jodie Foster's Delacourt twirled her mustache just a little too often. Her character may have been a "well-intentioned extremist" for her part, but there was never any doubts about who you wanted to come out on top at the end. My aim was to clean up the film as much as I could by mostly removing Delacourt and focusing solely on Max (and Frey a bit as well) and his journey to Elysium. I've also tweaked the introduction to suggest that no one from Earth who was born there ever made it to Elysium at all. I had originally toyed with the idea of using the Spanish audio track for the majority of the film, but I abandoned the idea after subtitling proved problematic. My main goal was to streamline the film as much as possible while maintaining the remaining characters as much as possible. This list is far from exhaustive as I made this edit a couple of years before submission and didn't keep a detailed list. 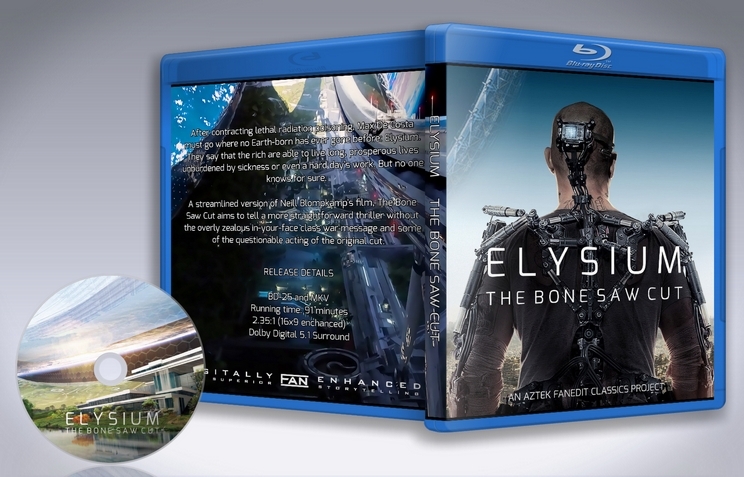 - New introductory text sets up the premise that no one from Earth has been to Elysium. - Cut the first scene (and subsequent deportation) of Earth refugees trying to land on Elysium. Parts of this were re-purposed for the intro. - Cut the opening flashbacks with Max and Frey and moved them to later in the film. - Re-edited a sequence that I call "Max De Costa's Horrible, No Good, Very Bad Day." He gets his arm broken, is nearly fired from his job (twice) and then gets irradiated and nearly dies. Made a few trims around these cuts. - Cut Kruger being fired. - Cut Kruger and his posse getting called in to stop the data heist. - Cut ALL scenes of Delacourt planning and scheming to take over Elysium. She now only appears in two scenes at the end. Watched the fanedit and it is definitely the superior version. The framerate seemed off, don't know if that is from shaky cam but movement and camera pans didn't feel smooth; walking scene at 38 minutes is one example. 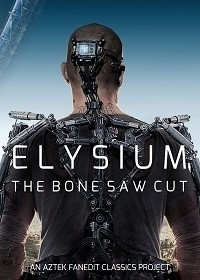 Didn't explain code to reboot Elysium or the betrayal plot, but then again leaving it in would make it worse. Other than that it brings it closer to what it should have been, Battle Angel Alita. A parasitic space city, annoying droids, crazy cyborg bounty hunters that want to pull out katanas. Sound familiar? The film works better as a weird wasteland with black comedy moments, "I've always wanted a wife". "The public security system is nothing more than a debugging routine to ensure the smooth operation of the factories. The factories operate entirely for the sake of Tiphares and are not concerned with the daily lives of the residents of the scrapyard." The problem is Alita fleshes out a lot more backstory and history. It is more a case of programmed auto pilot from previous wars that have become legend, the space citizens are kept just as drugged and pacified. Instead of evil rich people hoarding technology that wouldn't cost them anything to share. 1. Take out the cause of overpopulation and disease. It would still be a lot easier to build gated communities on Earth than a space station, and basic technology solves both of these things in the real world. They were added to try to boost the heavy handed political message that doesn't work. Instead have an unknown past war reduce the population to a handful of mega cities in the few habitable zones, and no one even knows what year it is. 2. State that all unauthorized technology is illegal, especially spacecraft. The original film had it so once all the rich people leave no one can solve any problems on Earth. The criminals in the film acted more like underground resistance than criminals, crimelords don't normally want to reboot the system to help everyone. 3. It would be cool to throw in scenes from Rollerball as part of the bread and circus to keep people entertained. Or even wasteland scenes from the Road Warrior, Fury Road, The Postman etc.. into the opening to set the tone as over the top weird wasteland. Or even go full retro and open with 199X. Kruger acts more like a wasteland barbarian from Mad Max then real military, maybe add back more of his scenes except the missile launcher one.